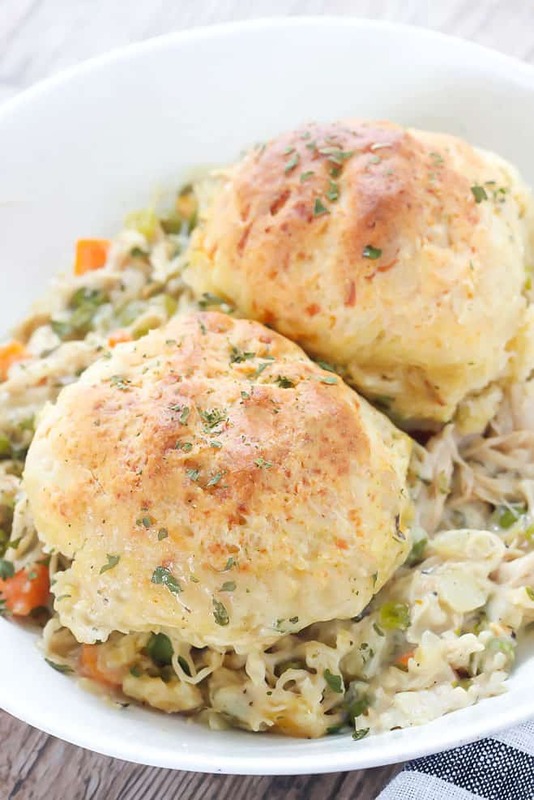 Chicken and Biscuits Cobbler – Comfort food is the name of the game when it comes to this Chicken and Biscuits Cobbler, combining two southern favorites into one! Hey y’all, and happy November! I’ve got a quick recipe to share today that I think y’all are going to LOVE! Chicken and Biscuits Cobbler!???? Every bit of this delicious cobbler is made from scratch, from the filling all the way to the easy drop biscuits! 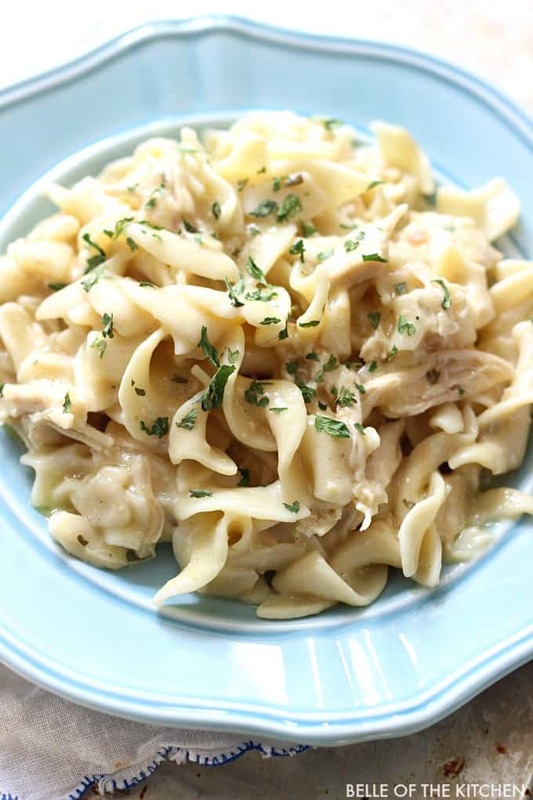 This is a favorite at our house, and it’s perfect comfort food for the cooler weather ahead over the next few months. 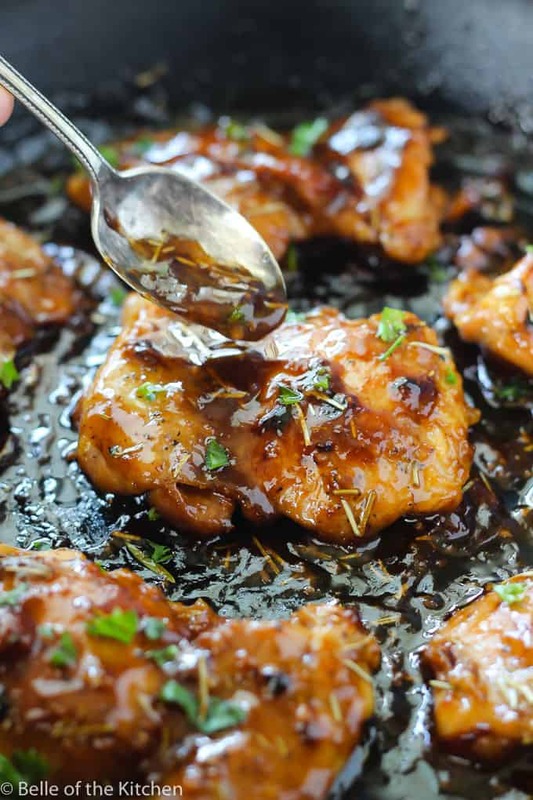 This would also be a great way to use up leftover turkey from the holidays! Just use the same amount in place of the chicken and you’re set. Enjoy! 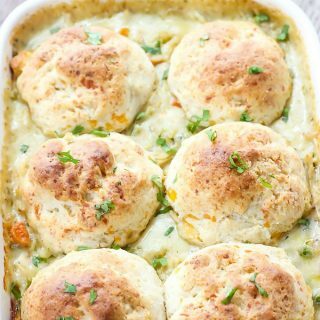 Comfort food is the name of the game when it comes to this Chicken and Biscuits Cobbler, combining two southern favorites into one. Preheat the oven to 400°F (200°C). Spray an 11x7-inch baking pan with cooking spray and set aside. Melt the butter in a large skillet over medium high heat. Add the onion, celery, carrots, and peas, and cook until the vegetables are tender, about 5-7 minutes. Add in the garlic and cook for 1 minute more until nice and fragrant. Add the chicken and stir everything well. Sprinkle the flour over the top of the chicken and vegetables and stir until everything is evenly coated. Cook for 2 more minutes, then add the chicken broth to the pan. Stir constantly for 2-3 more minutes until the mixture starts to thicken. Season with the thyme, parsley, seasoned salt, poultry seasoning, garlic powder, and some pepper to taste. Stir in the heavy cream and cook for 2-3 more minutes until nice and thick. Pour into the prepared baking pan. To make the biscuits, combine the flour, baking powder, salt, and sugar in the bowl of a food processor and pulse a few times to combine. Add the butter and process the ingredients together until crumbly. Add the milk and shredded cheddar and process until the dough comes together in one large clump. Use a large spoon or measuring cup (about 1/3 cup) to scoop 6 equal mounds of the dough from the bowl. I then use my hands to make them into roundish balls before placing them on top of the chicken mixture in the baking pan. 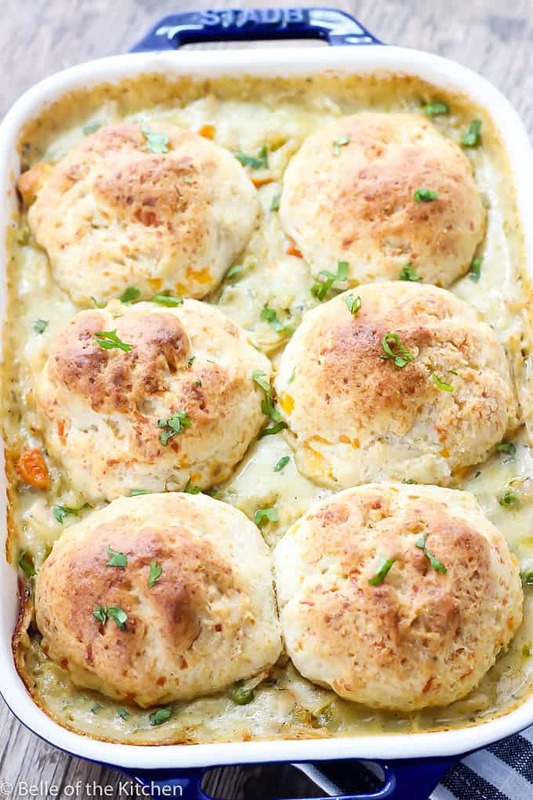 Place in the oven and bake for 25-30 minutes until filling is bubbly and biscuits are golden brown on top and cooked through. Let it cool slightly before serving. Enjoy! That looks like the most amazing casserole. Gorgeous biscuits – Love that they’re from scratch. This is the perfect comfort food meal! It looks absolutely amazing! Thank you for sharing! It’s (hopefully) going to snow here and this is exactly the kind of thing I like to make when it’s cold and snowy!! Comfort food at it’s finest! This looks so comforting and filling for a cold winter night. And I’ll bet it makes for some yummy leftovers. I know my family would love this. We have lots of houseguests coming over the next month, and this would make a perfect dinner one night!! This looks so warm and comforting. Perfect for a cool winter’s night. I love that you call it a cobbler! We love meals like this that combine a few favorites. 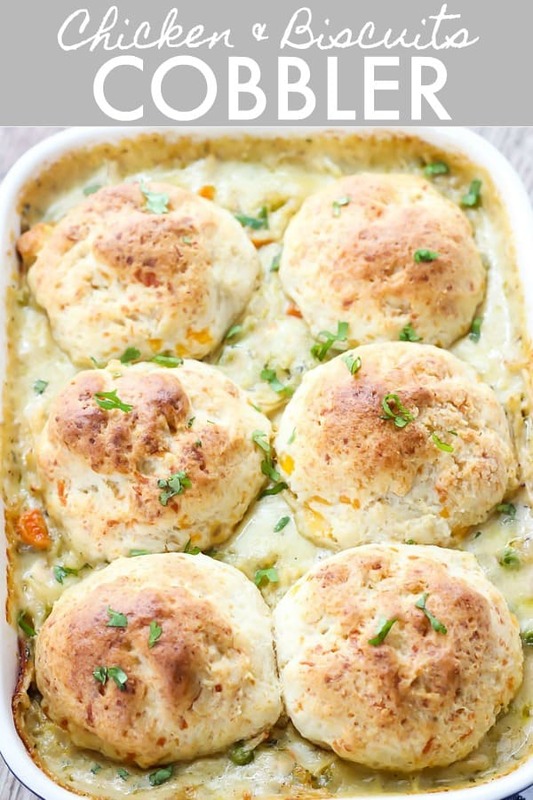 This chicken and biscuits cobbler looks so tasty that I wish I had some right now. This is comfort food at its finest! It looks so delicious!